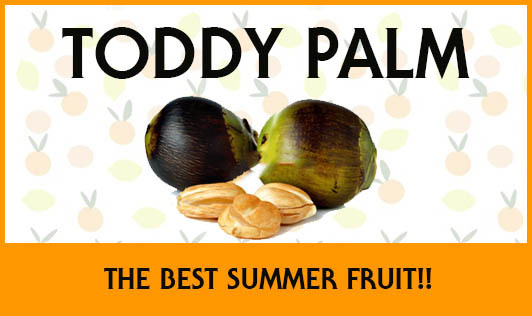 Toddy Palm Fruit- The Best Summer Fruit!! The thought of toddy palm fruits or ice apple kernels makes many so nostalgic. For most of us it relates back to our childhood memories and those good old summer holidays! This celestial fruit is just ideal to cool down and balance the body temperature in the soaring summer heat. This fruit has different names in different states of India. If it is taad gola in Maharashtra, it is called ‘nungu' in southern india. It is a fruit of the sugar palm tree that produces brown or black shiny nuts consisting of these delicious fruits. These fruits are delicate, soft, and juicy and tastes similar to coconut. This seasonal fruit comes in April to quench the summer heat and keep the body cool. It is also used to make refreshing drinks and desserts. But the best way to enjoy the fruit is to eat them when fresh. They are highly nutritious. It is rich in calcium, phosphorus, and B-complex vitamins. It is also known to balance the pH of the body, restores the good bacteria in the intestine there by curing indigestion, acidity and gastric problems. Enjoy this delicious and nutritious fruit this season!